The project titled “A case study of India’s favorite’s instant noodles-MAGGI, a product of Nestle India Pvt. Ltd.” deals with the study of the case of MAGGI ban, which happened in 2014. The project report mainly deals with the impact of ban on NESTLE’s financial results for the year 2014 and 2015. Also it studies the marketing and promotional strategies that are adopted by NESTLE India Limited post ban. The long term success of any company can be effectively measured in terms of brand value it creates in the market place, but more than that it is the brand image in the consumer’s heart which matters the most. The unique selling proposition of a particular product has to be the impact on environmental, social and human health criteria. Today, organizations are operating not only by fulfilling the government regulations, but arc partnering for the sustainability and responding to the increased concerns from the consumers and society about human health impact of the products, operations and resources depletion. The company that moves beyond the self-interest and operate selflessly for the betterment of all sectors it affects can actually secure self-interested achievements in the end. Food products industries have to be even more responsive as intake of bad quality product can cause irremediable harm to the health of the consumer and sometimes become the cause of death too. The Nestle India controversy these days have become an eye opener for many on one hand it shows that we Indians easily believe on what is said and not on what the reality is, it is very easy to be fool innocent consumers and make millions and billions of money. Many literate consumers also do not bother to read the ingredients except the expiry date or price on the pack which is their prime concern and it results because of the blind-folded faith in the brand. Even for the past more than 25 years our government, its officials were least bothered about the Indian masses. 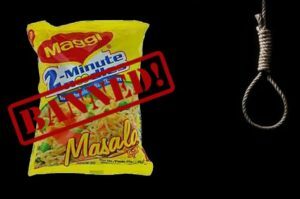 Till today the things have turned against Nestle India, which has landed the company to its dismal fate, the Indian government has filed case on the company to pay damages, the first case in India of this kind on the other hand company has firm opinion that the product is safe but the future of Maggi’s return is unpredictable. To examine the root cause of Maggi row. To assess the impact of Maggi row in India. To understand the marketing and promotional strategies adopted by NESTLE India Limited post ban. Time, being the major constraint while undertaking the research has limited it to an extent. Availability of resources like funds, appropriate data for analysis is another limitation of the study. Research comprises “creative work undertaken on a systematic basis in order to increase the stock of knowledge, including knowledge of humans, culture and society, and the use of this stock of knowledge to devise new applications. It is used to establish or confirm facts, reaffirm the results of previous work, solve new or existing problems, support theorems, or develop new theories. Research methodology is a systematic way to solve a problem. It is a science of studying how research is to be carried out. Essentially, the procedures by which researchers go about their work of describing, explaining and predicting phenomena are called research methodology. It is also defined as the study of methods by which knowledge is gained. Its Aim is to give the work plan of research. Data collection would basically mean systematic collection of data from various sources for undertaking a research. Data is the basic inputs for taking any decisions. Primary data: Primary data means fresh data which is collected for the first time with a stated purpose. It could be collected through surveys, observations, interviews etc. Secondary data: data which is gathered and analyzed by someone else and for an objective other than the current objective is secondary data. It involves less cost, time and efforts. This project is based on data collected from secondary sources such as newspapers, internet, magazines, books etc. Nestle S.A. is among the largest consumer packaged goods companies in the world, founded and headquartered in Vevey, Switzerland. Nestle originated in a!905 merger of the Anglo-Swiss Milk Company, which was established in 1866 by brothers George Page and Charles Page, and the Farinc lactee Henri Nestle Company, which was founded in 1866 by Henri Nestle, whose name meant “Little Nest”. The company grew significantly during the First World War and following the Second World War, eventually expanding its offerings beyond its early condensed milk and infant formula products. Today, the company operates in 86 countries around the world. NESTLE is the world’s leading Nutrition, Health and Wellness company. Our mission of “Good Food, Good Life” is to provide consumers with the best tasting, most nutritious choices in a wide range of food and beverage categories and eating occasions, from morning to night. The Company was founded in 1866 by Henri Nestle in Vevey, Switzerland, where our headquarters are still located today. We employ around 2, 80,000 people and have factories or operations in almost every country in the world. NESTLE’s relationship with India dates back to 1912, when it began trading as The NESTLE Anglo-Swiss Condensed Milk Company (Export) Limited, importing and selling finished products in the Indian market. After India’s independence in 1947, the economic policies of the Indian Government emphasized the need for local production. NP’! STLF responded to India’s aspirations by forming a company in India and set. Up its first factory in 1961 at Moga, Punjab, where the Government wanted NESTLES to develop the milk economy. The Company’s activities in India have facilitated direct and indirect employment and provides livelihood to about one million people including farmers, suppliers of packaging materials, services and other goods. The Company continuously focuses its efforts to better understand the changing lifestyles of India and anticipate consumer needs in order to provide Taste, Nutrition, Health and Wellness through its product offerings. NESTLE India manufactures products of truly international quality under internationally famous brand names such as NESCAFE, MAGGI, MILKYBAR, KIT KAT, BAR-ONE, MILKMAID and NESTEA and in recent years the Company has also introduced products of daily consumption and use such as NESTLE Milk, NESTLE SLIM Milk, NESTLE Dahi and NESTLE Jeera Raita. After more than a century-old association with the country, today, NESTLE India has presence across India with 8 manufacturing facilities and 4 branch offices. NESTLE India set up its first manufacturing facility at Moga (Punjab) in 1961 followed by its manufacturing facilities at Choladi (Tamil Nadu), in 1967; Nanjangud (Karnataka), in 1989; Samalkha (Haryana), in 1993; Ponda and Bicholim (Goa), in 1995 and 1997, respectively; and Pantnagar (Uttarakhand), in 2006. In 2012, Nestle India set up its 8th manufacturing facility at Tahliwal (Himachal Pradesh). The 4 Branch Offices located at Delhi, Mumbai, Chennai and Kolkata help facilitate the sales and marketing activities. The NESTLE India’s Head Office is located in Gurgaon, Haryana. Maggi instant noodles, foods major Nestlé’s flagship brand that has dominated the Indian instant noodles market for nearly three decades, is losing market share on a monthly basis to newer entrants such as Patanjali Noodles, GlaxoSmithKline’s (GSK) Horlicks Foodies, Hindustan Unilever’s (HUT.) Knorr Soupy noodles, Big Bazaar’s Tasty Treat, Top Ramen and several other smaller players. Halt of commercial activities related to the product, including sale and production. Removal of the “No Added MSG” claim from product packs. Withdrawal / recall of MAGGI oats Noodles as it did not have ‘Product Approval’. In June 2015, Nestle India files a legal petition with the Bombay High Court, seeking a judicial review of this order. While legal proceedings arc ongoing, Nestle continues to comply with the FSSAI order and destroys over 35,000 tonnes of the product, though the Bombay High Court allows Nestle India to continue exporting MAGGI Noodles. As the year passed, in the second half of the year in August 2015, The Bombay High Court overturns the government’s ban on MAGG3 Noodles, arguing that the move was “arbitrary” and “that principles of natural justice were not followed.” The court rules that Nestle India can bring the product back to the market if fresh tests – conducted in three accredited laboratories on the existing samples and subsequently on the freshly manufactured product – find the product safe. In October 2015, Test results from all three laboratories mandated by the Bombay High Court show MAGGI Noodles to be safe, with lead content well within the permissible limits. In compliance with the orders of the Bombay High Court, Nestle India commences manufacturing MAGGI Noodles and submits the new batches for fresh tests to reconfirm they are safe for consumption. In November 2015, All three NABL (National Accreditation Board for Testing and Calibration Laboratories) accredited laboratories – mandated by the Bombay High Court – find samples of the newly manufactured MAGGI Noodles to be safe for consumption, with lead content well within permissible limits. Now that the orders of the Bombay High Court have been complied with, Nestle India has made MAGGI Noodles available for sale once again. Affected by a countrywide recall and destruction of its instant noodle brand, Maggi, India’s largest food company by revenue, Nestle India, posted its first quarterly loss in 17 years. The Indian subsidiary of the world’s largest food company reported a Rs 64.4-crore net loss in what was its most challenging quarter to date. Thanks to the recall and ban of Maggi on June 5 (trouble for it began towards the end of May when sales began falling after detection of contaminants in some of the product’s samples), the company took a one-time charge of Rs 452 crore which hit its bottom line. Nestle India’s nine variants of Maggi noodles accounts for nearly 70% of the instant noodles market, which took a massive hit when a blanket ban was imposed on the product. After the ban was imposed on June 5, the company’s share price tanked. On June 8, three days after the pan-India ban was imposed, Nestle India’s share price was down to Rs 5,539.8, the lowest level it had seen all year. Since then, the company’s scrip has seen major volatility, regaining the highest level since the ban at Rs 6,831.95 per share on August 5. On the date, Goa deputy chief minister Francis D’Souica had said that he favored the re-think on the Maggi ban after the latest tests conducted by a central government laboratory in Karnataka found the instant noodles safe for consumption. Nestle added while releasing its results that the June quarter of this year was not comparable with the corresponding period last year. “Results for the quarter have been affected by the Maggi noodle issue,” it. said in its statutory statement. “Recent developments and growing concerns about the product had led to an environment of confusion, leading to the product being temporarily taken off shelves,” the company said. “Without question, trust has been hit and for Nestle to win that back will not be easy,” a senior industry executive from a rival company said. “While Maggi contributed some 22 per cent to the company’s revenue in 2008, it is now at 30 per cent,” this executive said. “In the same period, revenue contributions of Nestle’s ‘chocolate & confectionery’ and ‘beverages’ businesses have together come down to some 25 per cent from 32 per cent,” he added. As things stand today, Nestle India derives 46 per cent of its revenues from milk products and nutrition, 29 per cent from prepared dishes and cooking aids, 13 per cent from beverages and 12 per cent from chocolates. The Corporate Affairs Ministry imposed a nearly-Rs 640 crore fine on Nestle India, in lieu of finding MSG and lead beyond the permissible limit in Maggi noodles. The government filed a Rs 640-crore class action suit before the consumer forum National Consumer Disputes Redressal Commission (NCDRC). Out of this Rs 284.45 crore was sought in basic damages, and another Rs 355.5 crore in punitive damages. However, the government had said that the penalty could go higher as it was still calculating further damages to be sought. Nestle India’s managing director Etienne Benet was called back by the parent company on July 24. On August 1, Suresh Narayanan was appointed as the company’s new managing director. On Thursday, after announcing the Jul-Sep results, the company’s board appointed Narayanan as the company’s chairman too. The move came after Nestle India’s chairman Antonio Helio Waszyk retired on October 1. Nestle India shut down Maggi production at all of its eight production units in India. However, since the ban was set aside, Nestle India has started production at three of the eight factories. and wants to start production at all the factories soon. “We have resumed manufacturing of Maggi Noodles at three of our plants, at Nanjangud (Karnataka), Moga (Punjab) and Bicholim (Goa),” said a Nestle India Spokesperson. With the ban now kept aside and Maggi cleared for production, Nestle India is gearing to relaunch the instant noodles. For this, the company has said that it. Will be advertising aggressively, increased its spending on TV commercials. During the ban, Nestle India had come up with a series of advertisements to the theme #WeMissYoutoo. In today’s world of citizen journalism, news goes viral in a flash. And if it is bad news, it acquires a spin and speed that is virtually impossible to stop. Brands, therefore, are more susceptible to a tarnished image today, than in any other day and age. The cocktail of the online and offline world, consumer and shareholder activism, random decisions by government bodies, volatile social groups, and hatchet jobs by competing firms make it all too easy to fall from grace. And the loss of goodwill can play out in the form of decreased revenue, loss of clients or suppliers and loss of market share. Maggi re-launched with a digital media campaign “WeMissYouToo” and they have been promoting it forcefully on all brand’s social media channels. This as well as the brand has turned to a great degree brief in answering to their fan’s post. Be it loving their presents or answering on them, Maggi is trying to include an individual touch in their correspondence. In an interview, Narayanan said the organization is taking a look at setting up 24×7 sans toll customer services too keeping in mind the end goal to “get the connect, and network with the product consumer. Suresh Narayanan, chairman and managing director, Nestle India, said, “Our promotional strategy will be across three platforms. We will use traditional media to reassure our consumers regarding the safety of our product. We will connect digitally with our target group. Besides, there will be a lot of events tor brand activation.” The Swiss food major has also partnered with online marketplace Snap deal for selling Maggi. In 2013, Net sales grew up by 7.1% contributed by net realizations and volume growth in certain products as compared to year ended 2012. In 2014, the net sales grew up by 8.2% as compared to the previous year. In 2015, net sales decreased by 17.2% largely due to the impact of MAGGI noodles issue. Net domestic sales decreased by 18.3%. Export sales also decreased by 1.3% because of the MAGGI issue and lower coffee exports. 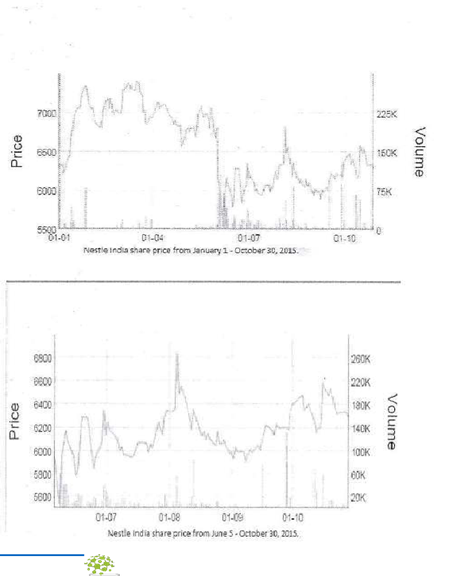 Share prices were also impacted with the MAGGI issue. The other current liabilities have increased, in comparison to the year 2014, mainly due to the MAGGI noodles issue liability. The Bollywood superstars who endorsed the brand are now facing the danger of FIR to be lodged against them under various Indian Penal (“ode sections which include section 420 charge for cheating consumers, section 270 charge for involving in the malignant act responsible for likely to spread diseases dangerous for human health and section 273 charge for getting involved in the promotion of sale of noxious food. Some websites and discussion forums reveal that it not the problem with the product rather the way it is cooked even the company agrees to this but then question arises why such warning was not given on the packet. MAGGI, being an icon of nestle; should not be the target of controversies that questioned its reputation. Nestle should attach more value and significance to its product. Each brand has a soul and distinct characteristics. That’s what distinguishes a cult brand from an average brand. Nestle should come up with representations at local vendors and media with its best product quality assurance and safety. Bearing the competition created by products of Knorr, patanjali, top ramen is an important task for nestle now, after the comeback. Nestle needs to re-formulate MAGG1 as per Indian standards and regulations, and replace them in stores. Investing in corporate social responsibility activities, signing a credible endorser, effective public relations etc. would help regain customer confidence. Nestle motto ‘Good Food, Good Life’ will have to prove its credibility and put a lot of efforts again as it has ended up in scratch. Nestle should concentrate on product portfolio diversification with focus on diary, beverages and coffee and also chocolates as well as confectioner}’ in order to avoid over-dependence on single product. It is rightly said one can do anything but only if God and Time permits. Those who fail to analyses the happenings in the surroundings become losers and those who accommodate and adjust according to time rule the world. The controversy started igniting last year but no officials of Nestle India paid heed to do the necessary rectification resulting now a bad name and shame for the company. Health is of prime concern for everyone though taste also matters. It is very difficult to restore the faith lost because even the school going kids now say -Maggi is bad. This controversy will surely lead to increased awareness among consumers for understanding the impact of any product before consumption rather than blindly believing on false claims in the advertisements. It will also pressurize the other food product giants to move cautiously by abiding the norms of Food and Safety regulatory norms.